Step 2 under "How to extract" reads "The application files are in the $INSTDIR folder". I don't think that is specific enough because it doesn't cater for people who are less technical. I would suggest you change it to read "Copy or move the contents of $INSTDIR to a folder of your choice". Suggest updating this, firstly when dl file extracted there is no temp, or uniblue folders, made .ini file and copied text to it. placed it into app. It then still placed folders in user/appdata/imgburn. God knows whats in the registry. no way this is stealth, at least not following the instructions. E 16:52:28 Reason: Access is denied. W 16:52:28 Errors were encountered when trying to access a drive. W 16:52:28 This drive will not be visible in the program. E 16:52:28 You need Administrative privileges to use SPTI. yes.. im aware of the FAQ ..
i was concerned with the "Autoplay" key..
the Tracing is part of normal operations but accidentally posted it because it was listed..
what the heck? .. i can't believe it..
i should have tried it but didn't think it could be the problem..
thanks for everyone's help ! "Certain exceptions are permitted. For example, registry entries that are created/updated by Windows for the application (eg. MRU entries for dialog boxes, DirectX entries for DirectX-based apps), or temp files created in the official "Temp" folders are not taken into consideration." I too am running Win 7 64bit and just scanned my registry and don't have those entries. Could it be that pfctoc.dll? Are you using it? i didn't test imgburn, but i think magibon is correct. apps running in xp 'behave' in a different way when running under win7 x64. under xp they may be portable or stealth, but under win7 that is not guaranteed. You can adjust the settings as much as you like, the PortableMode=1 in the ini 'should' override the settings in the registry tab. You shouldn't have any ImgBurn.~ keys left in the registry. 1. Go into 'Settings' and 'Restore Defaults'. 2. Run NirSoft RegScanner, scan for 'ImgBurn', highlight all keys (ImgBurn) and Create Del.reg. thanks .. i forgot to add the ".ini" file .. lol. i cleaned up the registry with ~.reg, added the ".ini", and re-checked. I looked in Settings and saw that ImgBurn was selected by default for a few Autoplay items.. so i unchecked them all..
am i not supposed to touch the settings ? I don't have any of those entries. If you have associated any files in the past (maybe inadvertently, in the settings) could also expain these leftover keys. Try deleting those keys and see if they return. I came across this today...haven't used it yet. Got this portable gem Imgburn 2.5.5.0 to work in win7 x64 ultimate, on a sata to usb adapted bluray burner! It reads, writes, and creates isos like a champ, where other established programs flopped. Absolutely unable to fault it so far! Thanks to portablefreeware dot com and posters here for the great tips as usual. DiscJuggler support in v2.5.5.0 is cool! Got to test it! I guess those comments by "nfl jerseys" (or jersey) and "preparing for 2012" is simply "spam potty training" and could be simply removed. Does not support multi-session burning. Get something else. Note: You can uninstall ImgBurn from your PC once you have completed these steps. The following registry entry is created. After the "installation" process (the ini file) imgburn opens and crashes within a second... someone knows why is that?. Forgot the quote "There's a new version of the installer that has the uniblue icons disabled by default and unless they're enabled in the installer, the items in the Tools menu won't appear either." Of course it's all about the money! Who likes to work for free? While I understand his position, I will think twice before using this one again. Thanks God, we have alternatives! I think I'd rather install CDBurnerXPPro! He chose his way, but I also can choose mine! "Oh ffs, it's a couple of menu options. Just don't click them!" "OMG, it's the end of the world! They run the programs if you have them installed, if not they take you to the web page. The 'scan for outdated drivers' one is actually very valid as we frequently tell people to do that anyway." I was refering to the portable (uniextracted) version. The links to the online scanners are under the tools tab (thus not avoidable, unless you reshack the thing). Should it still be in TPFC? I love ImgBurn, but it's become an adware tool now that it has built in links to Uniblue's DriverScanner, RegistryBooster and SpeedupMyPC online scanners. Can you verify your post? It'd be nice if, between everyone, we could figure out a 'final' answer for the easiest way to make this portable! I just posted a .bat launcher at http://www.portablefreeware.com/forums/viewtopic.php?f=2&t=6017 that can also handle portable file associations via eXpresso/C.A.F.E./Coffee, if anyone's interested. @Zina ImgBurn requires the /portable CLI otherwise the LogFiles will be created in the %AppData% directory. It worked for me, but seems way too complicated to understand all the settings fully. Also, it had some simple conflicts with other programs due to default file type (extension) usage. Thankfully, the file type usage can be edited in the program. I would love to use this program more if the settings weren't so intimidating. I only like using programs that I fully understand. But if you need something, ImgBurn is pretty likely to be capable is my guess. Don't use batch files for portable software, it's lamerville. It's a retarded solution and it only causes trouble. You accidentally start it the wrong way, or you set a file association with the .exe instead of the .bat, and BAM, the thing starts up and installs a whole messload of registry keys. ImgBurn does not need "/portable", all you have to do is manually add "PortableMode=1" to ImgBurn.ini and it will ALWAYS start up in portable mode. Don't you guys even CHECK for stuff like that before running lamerville "batch files?" 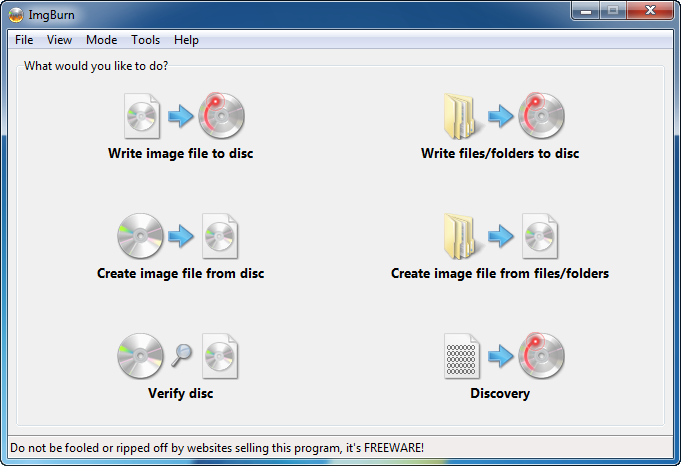 Does anybody know if it is a virus related to the image burn S.W.?? If not what could it be?? in your BATch file and that will close the DOS window automatically. Thank you, Manik. That did the trick. Another question: I read somewhere, but can't find it now, that there is a way to immediately close the DOS window as well. @Manik: Thankyou, I finally got this running. In file put everything but "
Now you can double click the.bat file and it will run it for you. Wont lemme use ISO files, why so? Launch using "ImgBurn.exe /portable". ? ImgBurn performed very well for me, and I just love the little jingle after success. I love to use this with the NRG2ISO Program they go Hand in hand.I havent had 1 problem with either one of them and have tested both on 12 different systems not 1 single problem yet. Os I have this installed on are Win XP pro and Home Win 2000 pro Win 2003 server and win 98 SE they work flawlessly. I've just done some back-to-back tests of 7 different portable burners & IMHO this is best. Even runs on a Vista WinPE LiveCD & on Wine! NuLL: it should look like DVD Decrypter, it's basically the same app (by the same guy) without the DeCSS and Macrovision removal code, as far as I know. Less...legal baggage. ImgBurn seams to test for internet connection before testing for updates. Solution: Uncheck under "settings/events" the "check for program update"-option. would anyone care to explain why this app calls microsoft (wwwtkttest2.microsoft.com - 207.46.198.30), then google (qb-in-f147.google.com - 72.14.205.147) and then yahoo before calling home to check for update (malthus.zen.co.uk - 212.23.8.80). Why does it need to check for connectivity in this way?